Brownsville United Methodist Church Pastor Thomas E. Uppole is pictured welcoming guests including (but not pictured) local historians John Rodman and Stacy Latham, and Brownsville residents Barbara Wiseman and Dave Skinner, both of whom were instrumental in organizing the day’s events. A nice crowd gathered despite the hot and humid weather. Among those in attendance were ONRA Board members Larry Bicking and his wife Liz, Charla Devine, Mike Peppe, Elizabeth Reeb, Doug Smith, and Mary Ellen Weingartner. Preparing to unveil the Eagle’s Nest Interpretive Sign are (left to right): Licking County Commissioners Tim Bubb, and Brad Feightner, ONRA Signage Committee Chair Mike Peppe, Barbara Wiseman, Bowling Green Township Trustee Donald Watkins, ONRA Vice President and County Commissioner Doug Smith, and Dave Skinner. 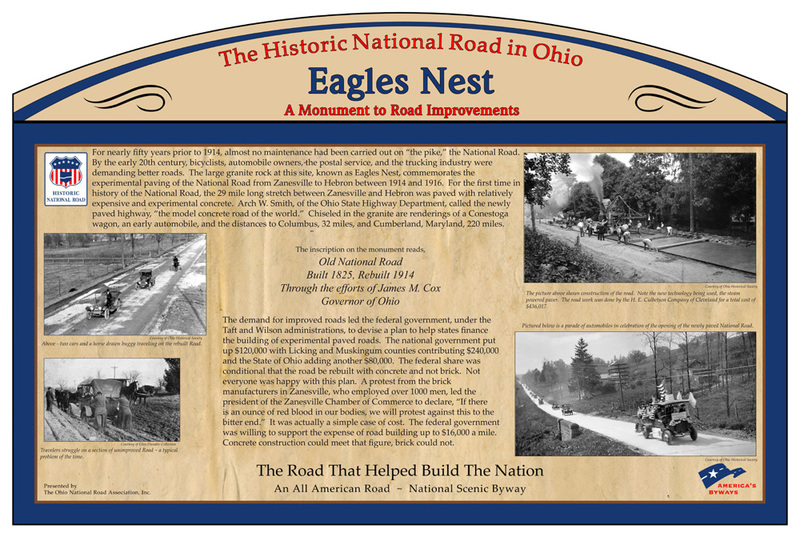 Trustee Donald Watkins admires the Interpretive Sign for Eagle’s Nest Monument, a large granite rock with an inscription commemorating the concrete paving of the National Road from Zanesville to Hebron from 1914 to 1916. The inscription on the rock reads: Old National Road. Built 1825. 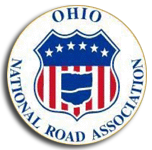 Rebuilt 1914, through the efforts of James M. Cox Governor of Ohio. A food wagon was on hand to offer cold drinks and sandwiches while local Amish families had delicious noodles, pies, jams and jellies available in the Bake Sale. Other activities included Cub Scout Pack 98 performing an American Flag Retirement Ceremony and displays including those of 100 years of Boy Scouting, the Historic National Road and local area history. Rides provided in Amish buggies added to the fun-filled family festivities. 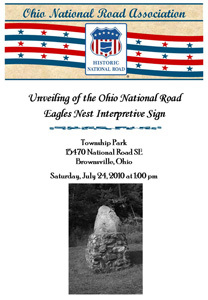 The Eagle’s Nest Monument Interpretive sign is shown in its permanent location near the monument on the north side of the National Road/U.S. 40, about a mile west of Brownsville. ODOT District 5 personnel Earl Simpson, Ron Miller and crew were most helpful in both the installation of the sign and with adding a section of asphalt pavement as a pull-off for the convenience of byway travelers.